I seem to be doing a poor job of writing about the future on this blog. And let's face it, there's nothing quite as mired in the past as the Confederate States of America. Regular readers might remember a post I wrote about nineteenth century Austin city marshal Ben Thompson. He was a larger than life gunfighter with a body count to rival the worst outlaw. But he was largely forgotten by history, presumably because he had a boring name and was never photographed in a cowboy hat. were for, but I'm not,so I didn't. 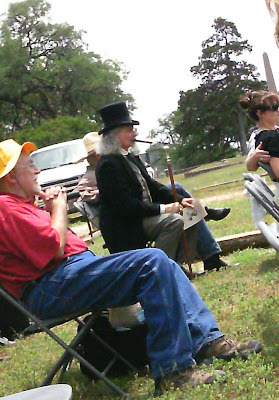 I have written about him several times, mainly because he embodied the same paradoxes as Austin's current police force, in that he was apparently well-meaning and consistently charitable to others, but he was also prone to acts of state-sponsored injustice (he once arrested a woman for wearing slacks) and unchecked violence (he routinely avoided homicide charges by invoking 'self-defense'). Presumably on the strengths of my multiple posts on Ben Thompson, the organizers of the Ben Thompson grave re-dedication offered me a press pass to the event. I accepted, largely because they promised a twenty-one musket and cannon salute, but also because no one has ever offered me a press pass before and how could I turn that down? 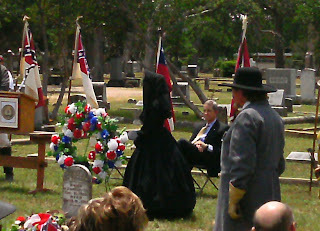 The ceremony took place at a city-owned cemetery, so I assumed it was an official event. 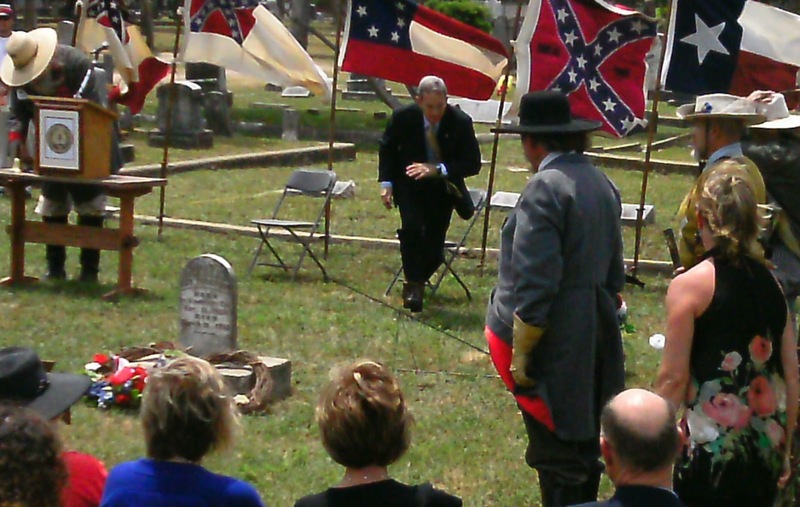 At that time it hadn't sunk in that the press release for the event used the word 'Confederate' six times. 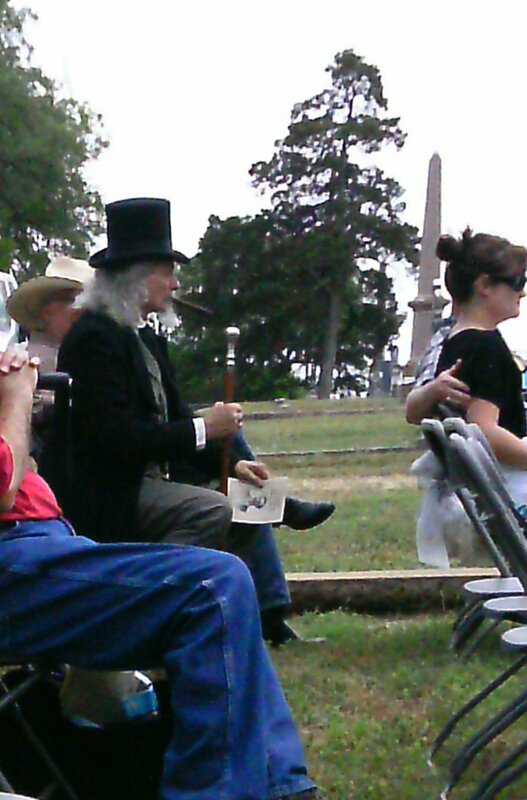 Taken as a whole, the event was about 90% Confederate. Thompson's great-granddaughter spoke and she was the only one who mentioned the parts of Thompson's life that fell outside of the Civil War. The rest of the program included a notorious Republican politician praising the “military tradition” of the Confederacy, masonic Confederate rites, and a truly awesome musket/canon fusillade. I arrived right as the ceremony began. While on my way to the event I worried that I would have trouble finding Thompson's grave in the rather large cemetery. I needn't have worried, all I had to do was follow the gay colors of four Confederate flags of various designs, a Texas flag, and, almost as an afterthought, the US flag. You would think that there was no point in having a press pass at an open event with about forty people, but I'm glad I registered because my press pass came with a swag bag. 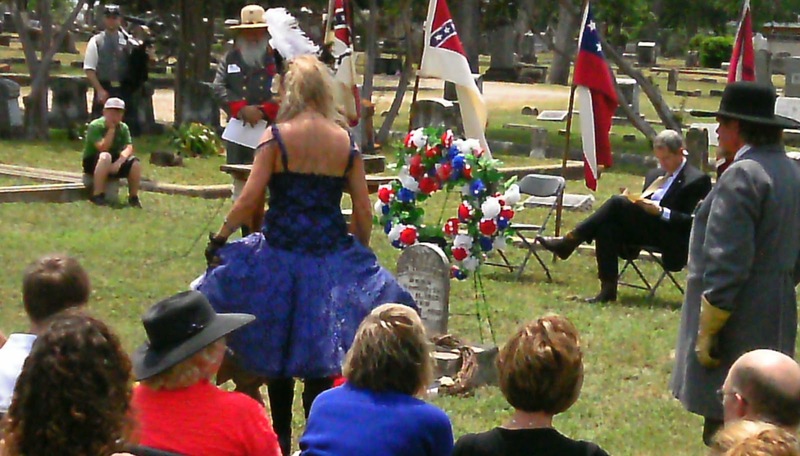 The contents included such treasures as invitations to join Confederate groups, a commemorative wooden coin from a company called Rebel Trucking, and tourist brochures for Giddings. 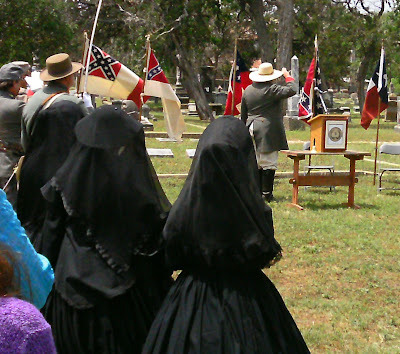 The master of ceremonies, a bearded officer in the gray, called the ceremony to order with a pledge of allegiance to the US flag, the Texas flag, and the array of Confederate flags. I guess that's the appropriate order. I don't know the words to the latter two, and everyone else in the crowd was mumbling so I may not have been the only one. The MC saluted the flags, but as I have never served in the military, either real or re-enacted, I merely doffed my hat. Have you ever been in a situation where you take your hat off during the pledge of allegiance to the US flag, and the next thing you know, you find yourself with your hand over your heart while everyone around you pledges their allegiance to the Confederate flag? It's awkward. 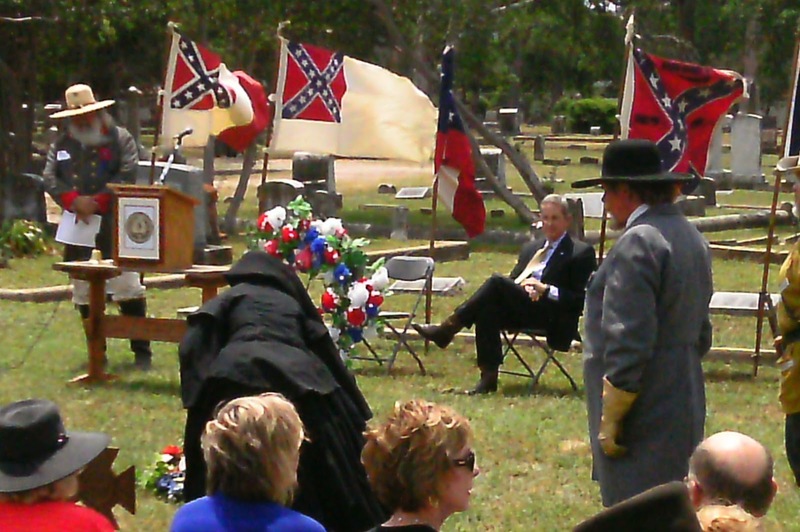 suspect that Patterson attended the event for the explicit purpose of having his picture taken in front of the Confederate flag. For those of you not from Texas, land commissioner is a not particularly high-profile post, probably about the fifth most powerful office in the state's executive branch (governor being about third or fourth). Commissioner Patterson has earned a name for himself by taking principled stands on issues where either the CSA or firearms play a prominent role. For instance, he's the reason why there's thousands of acres of quail and varmint hunting opportunities out by Big Bend, and as a holder of the Texas public hunting lands permit, he's earned my vote for just that reason. 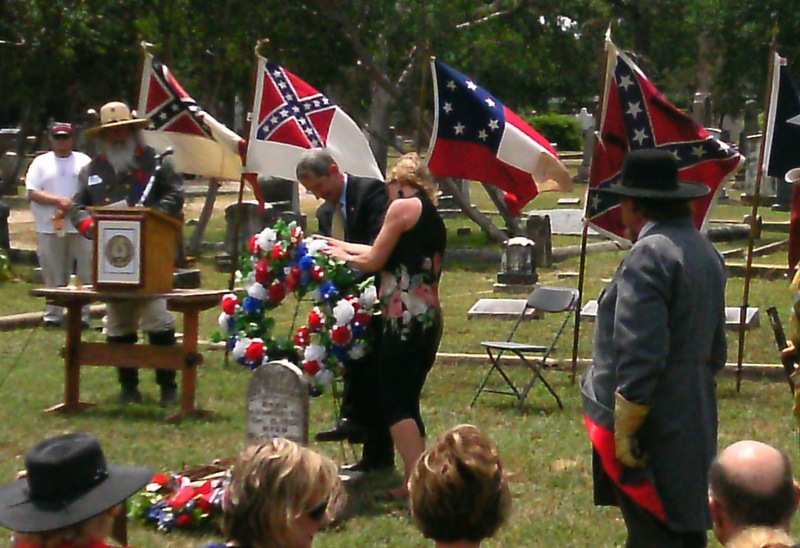 Patterson arrived late, missing the opening prayer (which we will NOT comment on), but when the wind blew away Ben Thompson's wreath, he leapt off his folding chair to grab it and return it to its rightful place. That's exactly the sort of level-headed can-do attitude that one expects of a public official when chaos strikes. opposite side of the nineteenth century continuum of womanly virtue. They dressed entirely in black, their faces obscured under a black veil. They looked like a cross between the Bene Gesserit and characters from a ghost story (you know the one, where a guy on a train wakes up in his sleeper car to find a strange woman in a rocking chair in the corner, and then it turns out that the lump she has under a shawl in her lap wasn't a child after all but her husband's severed head!). 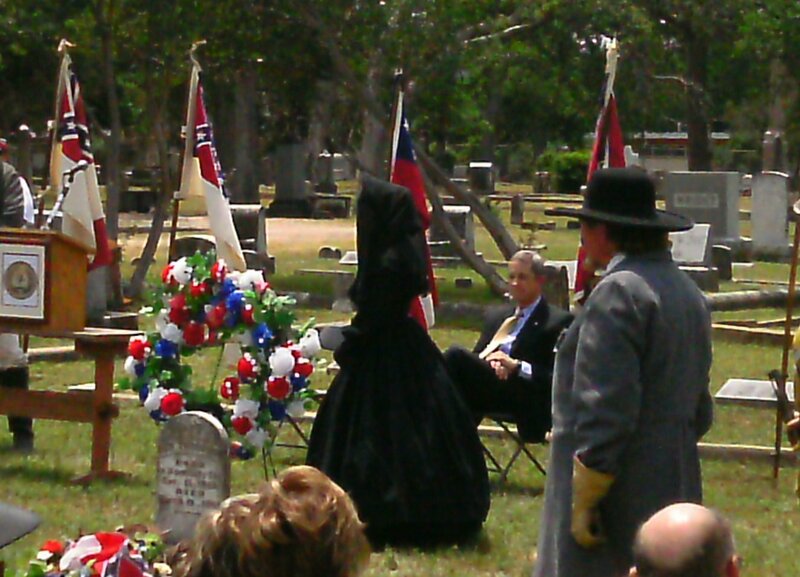 As far as I could tell, they didn't say a word the entire ceremony, just maintained their spooky silence as they proceeded one by one up to Thompson's grave and presented it with a single black rose. 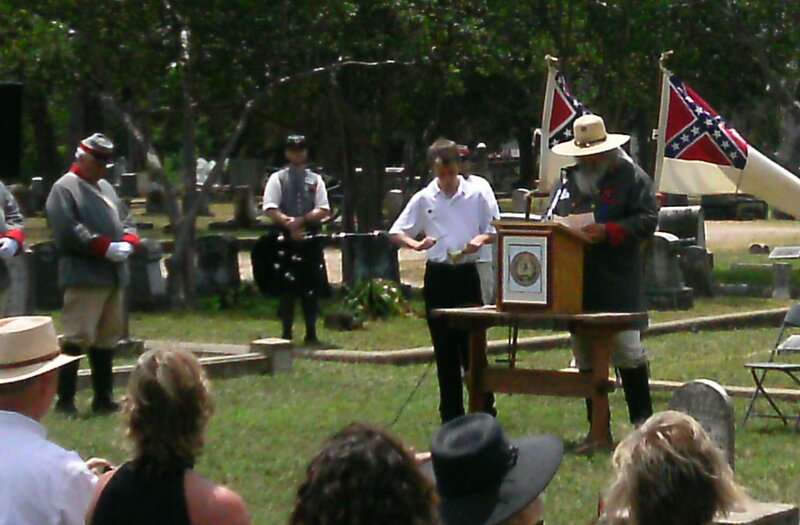 The MC then performed a ceremony where he read off the names of the Confederate dead and then rang a bell in remembrance. I believe they only read the names of the ones who Thompson knew personally, which took a lot less time than I had feared it would. 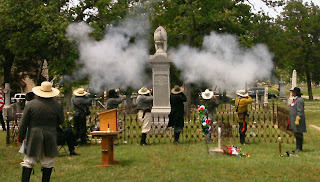 Then we got to the part I'd been waiting for, the firing of the cannon. I guess that our local CSA regiment was never properly disarmed after The War. Now comes the part of the article where I address the elephant in the blog post: Aren't people with a lot of confederate flags horrible racists? For instance, the KKK no longer dresses in the white hoods, they cover their faces with Confederate flag bandannas From what I saw during the Thompson event, I would say that although the Confederate re-enacters occupy the same iconographic continuum as the KKK, they don't seem like the same social group. In essence they don't appear much less dorky or guileless than the cosplayers the readers of this blog are familiar with. Think of them as steampunkers, but without the sense of whimsy. 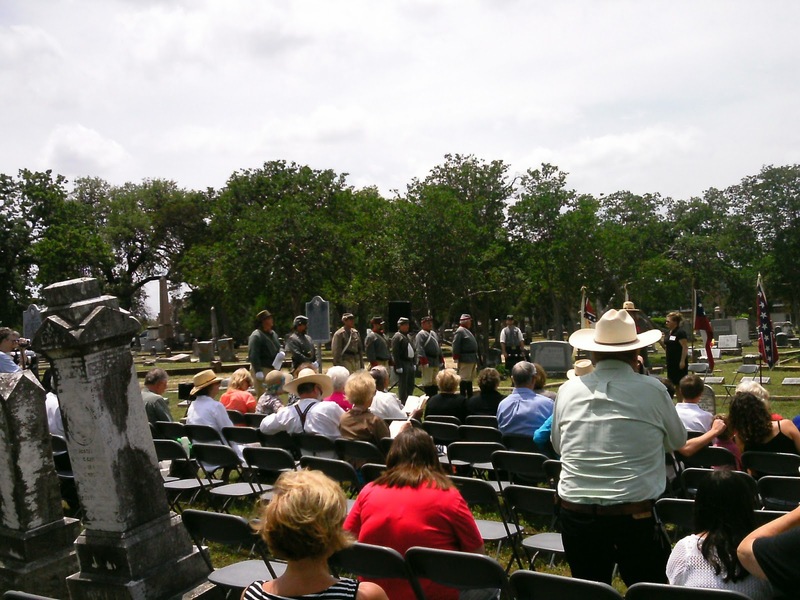 Commissioner Patterson made the point (in roughly so many words) that although our Texas ancestors have a lot of warts when viewed through a 21st century lens, it's not wrong to venerate the “military tradition” of the people who served. Far be it for me to criticize someone for celebrating their ancestors. After all, my family still holds the vikings in high esteem and that's not considered distasteful (at least in Minnesota). But maybe that's because so much time has passed, or maybe it's because nobody really denies that vikings were terrifying racist murders. Certainly nobody wants the vikings to come back into power. Likewise, for all the talk of Texas secession, it seems unlikely that there's any serious attempts by the South to establish a golden circle plantation state any time in the near future. 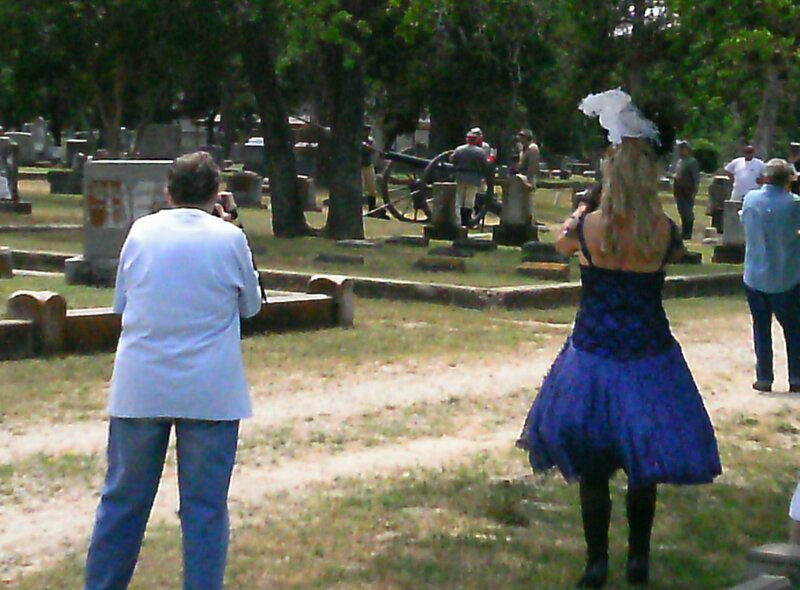 Maybe there's a sliding timeline of acceptable historical re-enactment? For instance, people celebrating the Germany of seventy years ago are clearly monsters. But Minnesotans celebrating the vikings of a thousand years ago (who were at least as bad as the Confederates on a sheer human suffering level) are considered cute. Flying the flag of the rebel south is probably somewhere in the middle. It has to be said that philosophy does apply, in some respect, to reenactment/fetishizing a past group. Germany 70 years ago and the US South during the rebellion were explicitly racist states; vikings were equal-opportunity murderous monsters. This makes me less comfortable with/more repulsed by the first two, since we actively confront these philosophical issues still today (whereas slaughtering monks for their gold has largely become a non-issue).